PowerShell is a commonly used program that coders use because it can be used with various other programs. Not only that, but it can also be helpful because PowerShell offers options that you are not going to get into other coding programs. 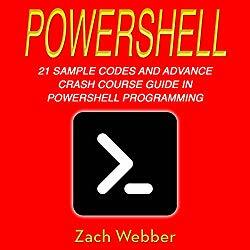 In this audiobook, you are going to see various coding samples that are going to help you advance your coding functions in PowerShell. You are going to have the option to have PowerShell automatically make decisions, or it is going to ask you for affirmation before it makes decisions. Taking your PowerShell game to the next level is going to help you out because PowerShell is going to become easier for you to use! In this audiobook, you are going to learn about Pester and how to use the advanced version of Pester. On top of that, you will also learn about the abstract code trees, JSON files, and so much more! So what are you waiting for? PowerShell is waiting for you, and you should stop delaying because you can start using PowerShell today! PLEASE NOTE: When you purchase this title, the accompanying PDF will be available in your Audible Library along with the audio.